Kali Mata Puja is performed on a new moon night. As Kali is associated with dark rites and demon worship, Kali Maa the rituals performed are austere and offered with great devotion. Terrifying than Durga is Kali, the black earth-mother, whose rites involve sacrificial killings. Kali has dark skin and hideous tusk face, smeared with blood, the brow bearing a third eye, like Shiva's. 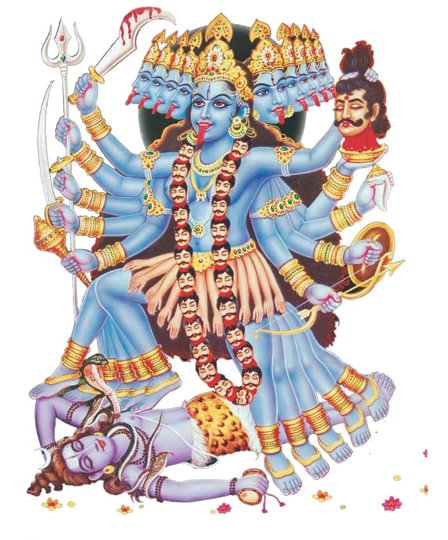 The worship of Kali reverses the ill-effects of black magic, and frees a person from the bad influences of spirits & ghosts. It also eliminates the harmful effects of malefic planets, especially Saturn, which are usually responsible for misfortunes, sufferings and sorrows in life. Her worship bestows spiritual power, and results in fulfillment of desires, increase in wealth and comforts of life.